Just a tweaking version, no fixings. Added a halo to the blue glow. Still things to fix, optimize, and add. And no, it still doesn't load/save to file. -The lensflare works inside the car, if you see it through a glass. I was surprised with this. -The GUI system is hell... It took me hours to get what you see. I'll open a new thread about this soon. New version of the lensflare editor. Now supports import and export to ".lensflare" files. If you press 'e' it will export the current lensflare to lf0.lensflare. Colors are useless right now. Released under both BSD license and Lesser GPL library license. // This file is a default skeleton. Replace all [ ... ] sections with yours. The GUI is updated with the import of the file. Also all fx code has been rewritten cause of a big bug. Mmmmm very nice all this, again ! It could be a very nice if the config file allows to provides custom textures (and colors), so one can create totally different looking lens-flares. I can even try to add a file picker and a color picker to the GUI system so your lens-editor allows to change these settings in realtime ! No ? Color picker, File chooser... nice!! No problem with adding custom textures and colors. But I though and the color maybe is useless if we have a custom texture, even more is we are "burning" them, cause the tone information tents to disappear. But more tests are needed. Well.... in fact it would be a full rewrite...it's possible. Shaders based HDR could be an interesting alternative. OK, I'll try to work on a color picker ASAP, and will "eventually" try a file picker (requires way more work and changes to GUI system). Shader based HDR is quiet easy to implement, but does not fit in Raydium requirements. Users are not supposed to have shader support to use Raydium applications. The current HDR code is fine, it's only a matter of texture format "mask reading" compatibility, with some low end cards (as my ATI X600 Mobility). I'll probably have to provide different rendering paths, depending on the hardware. Ok, i'll be waiting for those new pickers. Sorry for pushing up this thread, which is nearly about a year old now, but I really like to have a basic lens flare effect system integrated within the engine. I really like this effect at the current state as it was already done by Vicente. I've totally reread the older thread from 2006 about lens flares and this one again. There was invested much time and hard work into this topic, I don't want that it was wasted. Please don't throw everything away. @Vicente: Is it possible to upload a package with the latest version available including all resources (source code files also including the examples and editor, textures, other resources)? Perhaps I'll try to continue working on it in the future, so we can add this to the list of features. Perhaps it's sensible to polish everything to prepare and finally commit it. Afterwards we could add some more extras, where we have already talked about like variable colors and custom textures. Currently it seems for me that everyone want to have this feature and that it is a must have for the engine. Perhaps we are in a deadlock between Vicente and Xfennec, waiting to finish something from the other side respectively, but it's only a guess. Yeah, it's right, I stopped dev on my color picker ! I've a diff somewhere, and I can start to work on this again. In facts, this GUI widget was far more complicated to write than I tough at first, so I translated my time to some other "more critical" topics. But nothing was thrown away ! Ok, I'm quite busy today (and maybe tomorrow) but ASAP I'll upload a package with everything I have about this. It's not really a patch cause all the files are different from the official raydium ones. So you just have to unzip them in raydium folder. Tell me if something is missing/wrong. Thanks for providing the latest files. I'll try to work on this feature in the future. As written before, my plan in general is to integrate a basic lens flare effect to the engine, then to polish everything including some documentation and finally to commit it. Afterwards, after the initial commit to the trunk, we could add some more detailed extras. Before the first commit to the trunk I'll surely post a patch package, so you can have a look and check it. To be short, I'm in a hurry, because I'm currently moving to another city. I haven't much time and quietness for now to describe all the changes in detail. For me, the feature is now complete, all relevant things were implemented, perhaps it could be improved here and there, but all in all it's exactly what I'd initially requested. Critics and comments are welcome. I struggled to find an Internet access to post my comments on this patch ! This lens flare system seems simpler to the user than vicente's flavor, since most of the job and decisions are done "inside Raydium", at the cost of lower setting possibilities. It's OK to me, vicente may comment this point. 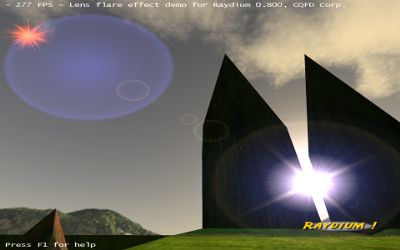 - package system is cool I've added "raydium_path_package_register("data-lensflare.zip")" to the main() of the demo and it worked perfectly. - (not really related to topic) HDR effect is always "unstable". With fullscreen, on my Mobility Radeon HD 3400, it's slow like hell. I hate low-end ATI cards I don't think it's currently a good idea to enable it by default in the demo application. Sounds this feature is finally very close to an official release ! Thanks for the detailed review. I totally agree with you in all points. I'll work on these changes and commit the module soon (maybe next weekend). The connection with RayODE was also in my mind, but I haven't found an easy way to implement it yet. Perhaps you could add this helpful addition after my commit.